Can a daily supplement prevent colds and protect your eyes? Vitamin C, also known as ascorbic acid, is an essential nutrient that keeps the body functioning. Found in foods and dietary supplements, it aids in many biological functions, including the synthesis of collagen, the healing of wounds, and the repair and maintenance of cartilage, bones, and teeth. Vitamin C is also an antioxidant, meaning that it can neutralize free radicals that can damage cells at the genetic level. Vitamin C has been used historically to prevent or treat scurvy and other illnesses associated with vitamin C deficiency. Today, it is widely touted as a natural defense against the common colds. Although vitamin C is considered to be an "immune booster," there is little evidence that taking it can actually prevent or treat an infection. Good sources of vitamin C can be found in fruits and vegetable, especially citrus fruits. The one condition vitamin C can most definitely treat is vitamin C deficiency. According to research from the Centers for Disease Control and Prevention (CDC), an estimated 7.1 percent of the U.S. population can be classified as being vitamin C deficient. Those will a severe dietary deficiency can develop scurvy, characterized by bruising, bleeding gums, weakness, fatigue, and rash. Outside of a known deficiency, vitamin C is believed by some to aid in the treatment or prevention of numerous diseases, including colds, asthma, bronchitis, cancer, chronic pain, cataracts, gastritis, glaucoma, heart disease, high blood pressure, osteoarthritis, and Parkinson's disease. Although the evidence supporting these claims is generally weak, there have some been several promising findings in recent years. The benefits of vitamin C in fighting the common cold is more presumed than evidenced by research. According to a 2007 review of studies involving 13 clinical trials and 11,350 participants, vitamin C supplements did nothing to reduce the rate the colds compared to the general population. With that being said, the authors noted that vitamin C could potentially benefit performance athletes or people living in extremely cold climates. A 2013 review from Finland similarly concluded that vitamin C cannot prevent colds but may shorten the course of the illness by up to 12 percent in adults and 21 percent in children with a daily 1,000- to 2,000-milligram dose. There is some evidence that vitamin C supplements may slow the progression of macular degeneration, an aging-related eye disorder characterized by vision loss. A 2001 study in the Archives of Ophthalmology reported that people at high risk of the disease who took 500 milligrams of vitamin C per day, along with beta-carotene, vitamin E and zinc, slowed the progression of macular degeneration by 25 percent and the loss of visual acuity by 19 percent. A 2014 review from Tufts University further concluded that taking 135 milligrams of vitamin C daily can prevent certain types of cataracts and that doses of over 300 milligrams could reduce the risk by no less than 57 percent. The benefits of vitamin C in treating hypertension (high blood pressure) have long been touted, although the actual effects are not nearly as robust as once thought. According to a 2012 study from Johns Hopkins University, high doses of vitamin C—around 500 milligrams daily—produced only small reductions in the systolic (upper) blood pressure but had little effect on the diastolic (lower) blood pressure. While scientists have yet to establish why this is, it is thought that high doses of vitamin C have a mild diuretic effect that promotes the removal of excess fluid from the body. This may help lower the pressure within your blood vessels. Vitamin C is often erroneously lauded for its ability to fight heart disease and cancer. Much of the misperception has been fueled by vitamin C's antioxidant properties. While antioxidants can most definitely reduce the oxidative stress associated with these diseases, there is little to no evidence that vitamin C supplements can directly influence the risk. An eight-year study involving 14,641 men over the age of 50 showed that a 400-IU dose of vitamin C did nothing to alter the rate of heart attacks or stroke compared to a placebo. A nine-year study involving 8,171 older women demonstrated that 500 milligrams of vitamin C have no impact on the rate of cancer compared to the general population. Although vitamin C is generally considered safe, high doses can cause adverse effects, including heartburn, nausea, headaches, stomach cramps, and diarrhea. Doses over 2,000 milligrams are considered extreme and may increase the risk of severe diarrhea and kidney stones. While you can safely take vitamin C during pregnancy, excessive use may cause harm to the newborn. Generally speaking, between 85 and 120 milligrams per day is considered adequate. Vitamin C can also raise your blood sugar and should be used with caution if you have diabetes. In older women with diabetes, vitamin C in amounts greater than 300 milligrams per day increases the risk of death from heart disease. Vitamin C can slow the excretion of estrogen from the body. Taking vitamin C with estrogen or estrogen-based contraceptives may increase the risk of hormonal side effects. The opposite may occur with the antipsychotic drug Prolixin (fluphenazine). When taken together, vitamin C can reduce the concentration of Prolixin in the bloodstream and reduce the drug's efficacy. Vitamin C supplements can also make certain chemotherapy drugs less effective. To avoid interactions, let your doctor know if you are taking or planning to take vitamin C with any of these types of medications. People who smoke should take an additional 35 milligram per day. Those with a diagnosed vitamin C deficiency should take between 100 to 200 milligrams per day until blood levels are normalized. Vitamin supplements are available as tablets, capsules, chewable tablets, gummies, and effervescent powders and tablets. Despite what some may tell you, a vitamin C gummie is no more or less effective than a tablet or capsule. 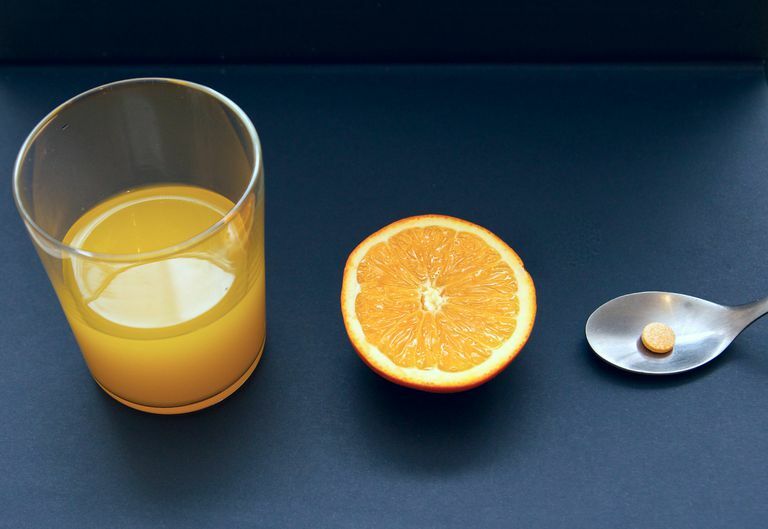 Not all vitamin C supplements are created equal. To better ensure quality and safety, choose supplements that have been tested and certified by an independent certifying body like the U.S. Pharmacopeia (USP), ConsumerLab, or NSF International. Also, be aware that there are different types of vitamin C, including L-ascorbic acid (typically derived from corn) and others that combine ascorbic acid with minerals (such as sodium or calcium), citrus bioflavonoids, or rose hips. None is considered better or more effective than the other. If anything, you can save money by choosing a "plain" L-ascorbic acid supplements and avoiding all of the other non-essential add-ins. As a general rule, it is always best to get your nutrients from food rather than pills. With that being said, taking a daily vitamin C supplement won't cause you any harm and can bolster your RDA if you happen to fall short. Age-Related Eye Disease Study Research Group. A randomized, placebo-controlled, clinical trial of high-dose supplementation with vitamins C and E and beta carotene for age-related cataract and vision loss: AREDS report no. 9. Arch Ophthalmol. 2001 Oct;119(10):1439-52. Douglas, R.; Hemilä, H.; Chalker, E. et al. Vitamin C for preventing and treating the common cold. Cochrane Database Syst Rev. 2007 18;(3):CD000980. DOI: 10.1002/14651858.CD000980.pub3. Hemilä, H. and Chalker, E. Vitamin C for preventing and treating the common cold. Cochrane Database Syst Rev. 2013 Jan 31;(1):CD000980. DOI: 10.1002/14651858.CD000980.pub4. Juraschek, S.; Guallar, E.; Appel, L. et al. Effects of vitamin C supplementation on blood pressure: a meta-analysis of randomized controlled trials. Am J Clin Nutr. 2012 May;95(5):1079-88. DOI: 10.3945/ajcn.111.027995. Lin, J.; Cook, N.; Albert, C. et al. Vitamins C and E and beta carotene supplementation and cancer risk: a randomized controlled trial. J Natl Cancer Inst. 2009 7;101(1):14-23. DOI: 10.1093/jnci/djn438. Schleicher, R.; Carroll, M.; Ford, E. et al. Serum vitamin C and the prevalence of vitamin C deficiency in the United States: 2003-2004 National Health and Nutrition Examination Survey (NHANES). Am J Clin Nutr. 2009 Nov;90(5):1252-63. DOI: 10.3945/ajcn.2008.27016. Sesso, H.; Buring, J.; Christen, W. et al. Vitamins E and C in the prevention of cardiovascular disease in men: the Physicians' Health Study II randomized controlled trial. JAMA. 2008 12;300(18):2123-33. Slatore, C.; Littman, A.; Au, D. et al. Long-term use of supplemental multivitamins, vitamin C, vitamin E, and folate does not reduce the risk of lung cancer. Am J Respir Crit Care Med. 2008;177(5):524-30. Weikel, K.; Garber, C.; Baburins, A. et al. Nutritional modulation of cataract. Nutr Rev. 2014 Jan;72(1):30-47. DOI: 10.1111/nure.12077.